2004 - Mike Lamb devours Colorado pitching with four hits, including a double and triple, along with six RBIs to pace a 13-7 donnybrook over the Rockies. Craig Biggio and Orlando Palmeiro bash homers while Brandon Duckworth gets his first win as an Astro. 1997 - Seven Astros have multi-hit performances in an 11-7 thrashing at San Diego. Bill Spiers, Jeff Bagwell, Thomas Howard and Brad Ausmus have three-hit games in the 18-hit attack. 1986 - Down 2-0 with two outs and nobody on base in the top of the ninth, Houston rallies for a 3-2 triumph in Atlanta. Craig Reynolds gets the game-winner with a two-run single off Bruce Sutter. 1972 - Astros stun the Giants with ten runs in the ninth for a 13-7 victory. Cesar Cedeno contributes two hits in the inning, part of five on the day. Lee May has a three-run blast in the uprising. 1964 - Ken Johnson no-hits the Reds but the Colts still lose, 1-0 . The run scores when Nellie Fox boots Vada Pinson's grounder in the ninth. Pete Rose had reached on Johnson's two-base error to start the inning. Joe Nuxhall fans Johnny Weekly to seal Johnson's fate as the hard-luck loser. AstrosDaily.com is tested on Internet Explorer and Mozilla Firefox. It is designed to look best at either 800 x 600 or 1024 x 768 resolution. Will AL West Be Three-Way Race? Whoever said good pitching beats good hitting never met the Texas Rangers. The apparent strategy for their club this year is to forgo expensive pitchers and just concentrate on slamming the heck out of the ball - and for now, at least, it's working. 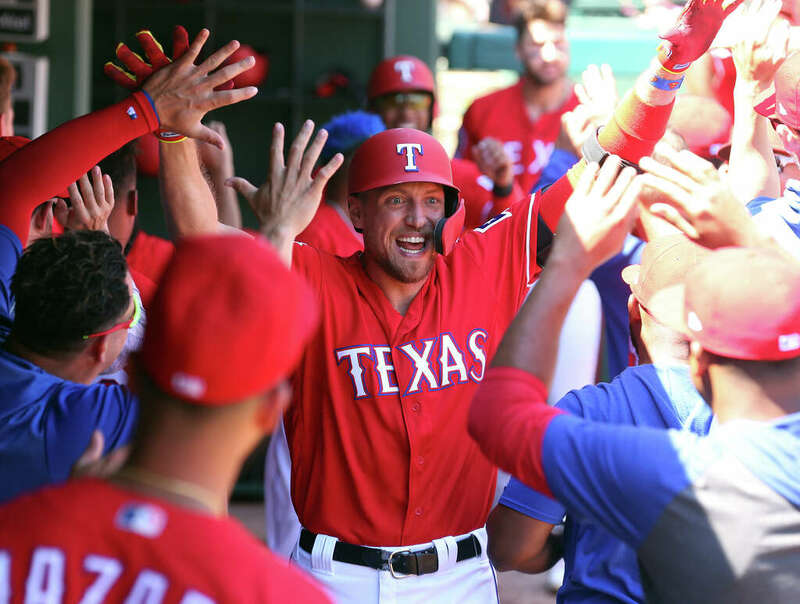 Our Metroplex neighbors took another three-game series from the Astros this weekend, winning by scores of 9-4 and 11-10 after dropping the opener to Justin Verlander, 7-2. The Rangers now have won 4-of-6 against Houston, representing fully half of the Astros' losses three weeks into the season. Gerrit Cole and Collin McHugh were both hammered into submission, forcing the Astros to play catch-up. On Sunday, the defending division champs almost pulled it off. Trailing 10-1 at one point, the Astros clawed back to within one run in the ninth and had the bases loaded when Robinson Chirinos fanned for the final out. McHugh's ERA exploded from 1.96 to 4.38 in one afternoon. You'd have thought Global Warming Park was a Sri Lankan church the way the bombs kept flying out on Easter Sunday. When the dust settled, the Astros were one game off the AL West pace behind Seattle while the whack-a-mole Rangers pushed within 1-1/2 games back. One need only take a peek at the Rangers' pitching statistics to think they would be easy pickings like they were last year. Eventually, it will catch up with them. What's crazy is that, entering Sunday, their 5.16 Team ERA (you read that right) wasn't even the worst in the league, or the second-worst, or third or fourth. Baltimore, Boston, Chicago and Kansas City were even worse! Don't look now but the Minnesota Twins are next to invade Minute Maid Park and threaten our perfect home record (6-0). The 12-7 Twinkettes have the league's best batting average (.275) through Saturday and are scoring at a pace of 5.72 runs per game. Their ERA is a respectable 4.60 (cue laugh track) and they lead the AL Central. Monday's 7:10 pm Central opener will feature Brad Peacock (2-0) returning to the rotation to face Houston's old nemesis Jake Odorizzi (1-2) who's lifetime mark against the Astros is 3-1 with a 2.12 ERA and a .176 OBA. The good news? Astros are 7-0 in series openers this season. Tuesday's 7:10 pm Central matchup will pit Wade Miley (1-2) against former Yankee Michael Pineda (2-1). Miley has a nearly two-run ERA advantage over Pineda in the early going. Wednesday's 7:10 pm Central finale brings back Verlander (3-0) who does not show a mound opponent according to MLB.com while CBS Sports.com claims it will be righthander Zack Littell who has not appeared this season. Last year, Littell was a September call-up who posted an 0-2 record with a 6.20 ERA which would qualify him for half the pitching staffs in the league based on April totals. Off the field, the ballclub swapped lefty relievers with AAA Round Rock again, recalling Framber Valdez (0-1, 6.00) and sending down Reymin Guduan (0-0, 6.75). The explanation given was that Valdez needed some tune-up time in the minors since he'd only made two appearances in the majors this season. I hope that was the reason, otherwise these two may be reviving the old Southwest Airlines shuttle between Hobby and Bergstrom throughout the summer. Valdez made it back in time to pitch 2-1/3rd innings in Sunday's loss, dropping his ERA to 5.06 despite allowing the eventual winning run. If you'd like to help AstrosDaily.com with writing, stats, web design or financial upkeep, contact me .